HISTORY ON WHEELS: Hume Highway came alive. IT'S 6AM on the Saturday of Mother's Day weekend and we were driving up through Christmas Hills out of Yarra Glen on our way to the Ford factory at Broadmeadows on Melbourne's northern fringe. The outside temp was 1 degree. At least it wasn't belting down rain as the forecast had been telling us for the past week. We were going to meet up with a bunch of blokes and their trucks, all of which were 25 years or older, to do a cruise up the Old Hume Hwy to Albury. 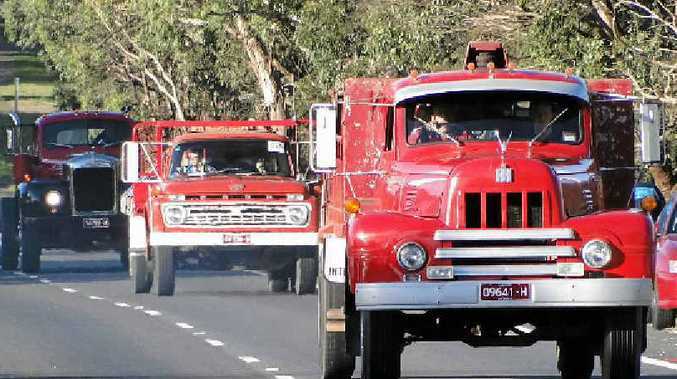 Last year the first Crawlin' the Hume was initiated by the West Sydney Truck Club, running from Casula to Yass. Society attended that event and had such a ball that they decided to organise a similar run north. Arriving at Broady we were greeted by more than140 of history's finest. Big trucks, little trucks and everything in between. Barry Kitto had driven his Inter R190 across from Perth just to join the "day trip". There were trucks from SA, NSW and Queensland that'd done the same. Some blokes had left home in their T-model Ford pick-ups at 3am to get there and it wasn't the warmest of mornings for open air touring. Doug and Pam McMillan had driven down from Albury - just to drive back again. "Pam asked if the heater was working and when I said 'no', she refused to come. So I connected it up and 10km down the road we were stripped down to the bare essentials. It was all or nothing," laughed Doug. This was a carnival atmosphere, plus. Blokes were looking in and under bonnets and wives were wrapping hands around hot cups of coffee generously donated by sponsor Coburg Truck Parts. Gavin Spence, the president of ATHS came by and was at pains to state he had nothing to do with organising the run. "Credit where credit is due," he said. "You know, if we all turned around and went home right now we'd all say what a great day we've had." "Our aim with this run is to enjoy driving our trucks in a relaxed atmosphere with no strict guidelines," Slasha said. "The plan is to recapture the past and to try to relive the old days when trucks were louder, slower, the roads were a lot rougher and the men were definitely tougher. We'll be visiting the old forgotten towns which were bypassed a long time ago." At 9am we set off for Wallan and Kilmore. Two kilometres up the road there's an old Ford 700 with the bonnet up and owner, Ronnie Campbell underneath, with three others laughing and offering advice. "No worries; if I can't get it fixed in the next 10 minutes I'll just drive it back without one - just like the good old days." Just after Wallan we headed up Pretty Sally, a 2km incline. At the top I pulled up, deciding it would be a good spot for a few happy snaps as the oldies and goldies would be struggling, giving me plenty of time to compose my shots. Standing in the middle of the road I saw a green speck at the bottom of the drop. By the time I've pressed the shutter, Peter Rowland in his 1947 Peterbilt had raced past me at 100kmh. On through Kilmore we went and already some drivers had pulled up for a chat, a cuppa and to check out each other's pride and joy. There's no fear of the cops catching anyone for a lack of down time. There were no rules and regulations on this run. Trucks left and rejoined the loose convoy at will. Next was Broadford, Tallarook and Seymour. We travelled through Mangalore, Avenal, Locksley and Longwood. Back in the '70s we regularly travelled through these towns. Today most of us had forgotten they existed. With no trucks and other traffic thundering through day and night, many of the towns have beautified their streetscapes and it's a shame most people bypass them, intent on getting from A to B. Many of the smaller towns have suffered huge economic loss as a consequence. We had also forgotten how narrow the old Hume was. Twists and turns and no overtaking lanes or Armco. Traffic lights in the bigger towns like Benalla and Wangaratta and intersections in the other towns and villages made the Hume a long, slow run. On this day the Jungle Drums were beating loudly, far and wide. In every town there were people standing on the side of the road, camera in hand, waiting for this cavalcade of Australian trucking history to pass by. The bad boys and bad girls of Baddaginnie had chairs and someone's couch set up on the side of the road. The slabs had been opened up and with stubbies in hand the locals cheered every truck that passed by. When asked why the interest, the unified response was, "we just love trucks". Winton Raceway opened their gates and kiosk, providing a lunch stop for the convoy. Again, those Jungle Drums brought many locals from Benalla and surrounding districts to view what was a truly spectacular display. Through Glenrowan, Wangaratta, Chiltern and on to Albury where the participants gathered for dinner, a few drinks and lots of bullshitting. This would have to be one of the best trucking days out that we have experienced. The camaraderie, the scenery, the memories and the appreciation of the general public for truckies and trucks made one feel proud and humble. Congratulations to Rob, Slasha and the others who spent months organising with police and councils along the route and the good folk of Winton Raceway to ensure the smooth running of this event. The plan is to alternate the Melbourne event with that of Sydneys. Can't wait to join the boys coming south next year.